am i ready for new york? this morning, murphy my always and forever cab driver picked me up for the ride to the airport. i had some exciting news for him. well, maybe we’re going to have to work on our domestic bliss! i told murphy i was off to see facebook friends in new york–and he wished me luck and took down my flight information so he could meet me upon my return. one of the most common things for agoraphobes to do is to want to remain in their “safe” place. that’s mostly their house, but sometimes it includes other places. in the past, my “safe” place has, at its best, included my house, downtown winnetka, my kids’ schools, and the place where i climb on a stairmaster in the vainglorious hope that i shall look like elle mcpherson one day. at its worst, my safe place has been my bedroom. even the walk across the hall to the bathroom seemed iffy. but last year, meeting my facebook friends in america and abroad, i have learned to make the safe place wherever i am. it’s a discipline i have to remember every time i go out. and sometimes it just doesn’t work. i had three housebound days this week and i was really worried that i wouldn’t get to the airport. the airport was crowding because a stormline was coming in and flights were being delayed, canceled, bumped. i aimed for the nearest bar. an airport bar is actually a great place to create a safe zone. forget about those big planes outside the window, forget about the people rushing back and forth, forget about the announcements, just find the place nearest your gate and pretend you’re in your own neighborhood. amongst friends. ..
look! even mr. clark is making friends! mr. william clark, as you know is the nineteenth century explorer best known for his travels (1803-1806) through the northwest with merriweather lewis — also known as the lewis and clark expedition. clark died in 1838 but oddly, he has a facebook profile page, posts daily accounts of his travels and is my facebook friend (f2fb friend #60). his biographer lanny jones (f2fb friend #59) sent me a Clark doll to remind me to explore fearlessly. looks like clark’s doing a little exploring of his own. 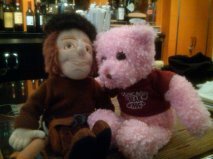 . .
mr. clark getting cozy with a teddy bear who was going home to new york with another traveler. i carry my william clark doll in my bag every flight i take and the back seat of my car? looks like a damn toys r’ us! This entry was posted on Monday, May 7th, 2012 at 1:02 pm	and tagged with agoraphobia, f2fb, facebook, friendship, new york, safe house, safe place, william clark and posted in Uncategorized. You can follow any responses to this entry through the RSS 2.0 feed. « batter up! aubrey huff has his days too! Be sure to tell “NewYork” that I think she is a fantastically courageous Woman to be hosting all those millions of people…!!! Talk about making friends…???! Wow…!!! Have a great trip Arlynn…..
Love this post, and Mr. Clark! I love the idea of a safe zone as we could all use that reminder to create this space for ourselves. Thank you so much for sharing! So glad you made it, Arlynn – I had such a blast hanging out with you!! Come back again soon!